Yogurt is a great source of calcium. 1 What Is Balkan Yogurt? 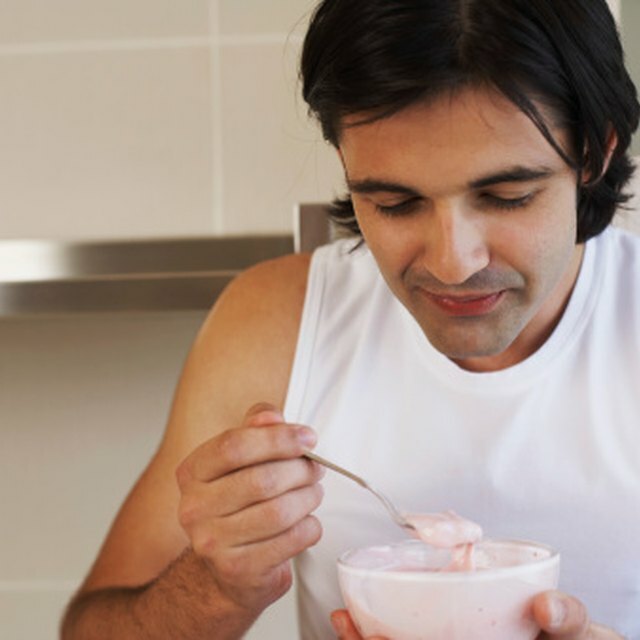 Yogurt manufacturers make yogurt by fermenting milk with specific bacteria. The fermentation process converts much of the lactose in the milk into lactic acid. Yogurt is therefore low in lactose and suitable for people with moderate lactose intolerance. Onken is a brand of yogurt and other products owned by Dr. Oetker, a grocery retailer based in Germany. This nutritional information applies specifically Onken brand natural yogurt. The brand does not significantly affect the nutritional content of yogurt, so this information generally applies to other brands of yogurt as well. The serving size is 100 grams, or about 3.5 ounces. A serving of Onken Wholegrain Strawberry yogurt has approximately 114 total calories, according to LIVESTRONG's food database MyPlate. Onken yogurt provides about 3.5 percent of the daily value for total calories based on a diet of 2,000 calories per day. Onken Wholegrain Strawberry yogurt contains 17.4 grams of carbohydrates per serving, according to MyPlate. This carbohydrate total consists of simple sugars at 15.2 grams, as Onken yogurt contains no starch or dietary fiber. A serving of Onken yogurt also contains 4.2 grams of protein, or about eight percent of the daily value for protein. A serving of Onken Wholegrain Strawberry yogurt contains 2.9 grams of fat, which is about six percent of the daily value for fats. Saturated fats account for 1.9 grams of this total. Onken yogurt does not contain cholesterol. Onken yogurt has about 125 milligrams of calcium per serving.